Does the How of Evangelism Really Matter? This evangelism is unbelievable because it is motivated by unbelief in the gospel. Our hidden belief is that doing evangelism makes us better with God. Or better in front of spiritual peers we esteem. The gospel can be easily dismissed because of the self-righteous manner of our gospel communication. When I was in college, I often felt guilty if days went by without sharing my faith. I was driven by performance. As a result, I’d end up sharing the righteousness of Christ with others in a self-righteous way. I would think to myself, “If I share the gospel, God will think better of me.” But that actually contradicts the gospel. God thinks perfectly of us, not because of our right performance, but because of Jesus’ righteousness performance! When we are caught in the performance act, we may come off wooden or uncaring. People need to not only “hear” the gospel but also “feel” it in our speech. 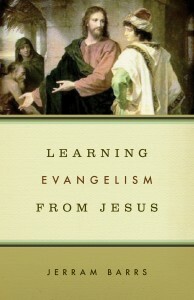 Good evangelism results in gospel stereo—Christ-shaped speech and action. The gospel can also be dismissed due to the sheepish manner of our evangelism. Sometimes we are indifferent to evangelism because we don’t want to come off as preachy. I was sitting in a Starbucks when a gentlemen asked me what I was doing. I replied, “Working on a sermon.” Oh, great, here it comes. Yep, he replied by waving his hands back and forth, across one another, saying “Don’t preach to me, don’t preach to me!” All accompanied by a nervous chuckle. How would you respond? I responded by saying, “You don’t have to worry about that.” Really?! I left the poor man with the wrong impression of gospel preaching—that it mounds up not relieves guilt. But the good news of the gospel is that Jesus absorbs our guilt and sets us free. That’s just what he needed to hear, just not in a “preachy” way. My sheepish indifference left him stranded in guilt. People interpret the gospel by how we say the gospel not just what we say. But it’s not enough to critique self-righteous and sheepish evangelism. We must reconstruct a biblically faithful, culturally sensitive, and personally discerning way forward.